*UPDATE* - Thank you to all who have made offers to perform. I was completely swamped and feel guilty I can't book everyone who applied. Currently the event is full. Further dates for May and June to be posted soon. Ollie Vee's, Leighton Buzzard, Bedfordshire will be hosting an Open Mic comedy night on the Friday 19th April. Slots of 5 /10 - available. Book in advance! First come first served. Regular monthly events. So get in contact if you fancy an email when events come up. A nice small friendly venue! 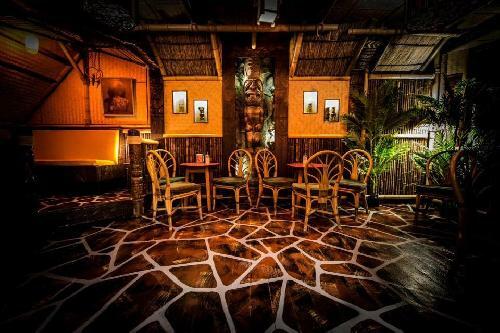 Leighton Buzzard's very own Tiki Lounge! Max crowd around 50 people. We've put on 8 open mic nights in the last 18 months and are looking to make it a monthly event. Would be great to hear from anyone who is interested in performing. Regulars get a chance to do longer sets and have a go at hosting if they fancy it. Contact Brendan for more details and booking.